Imagine the array of wonderfully inviting desserts you’re going to create. The table will be laden with colour, texture and amazing flavours: all it needs is some stunning cutlery to finish off the effect you’re created. These metallic look spoons also feature a sleek shiny black handle which adds to their attractiveness. Your guests will find them easy and lightweight to handle, and will be impressed by their high quality – and by your amazing food too of course! 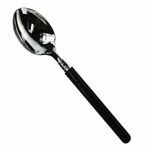 Disposable Metallic Look Spoons with Black Handle x 48 has not been evaluated yet.